Welcome to Day 2 of my series “16 Tips To Navigating The College Classroom,” If you have yet to see part one, I highly encourage you go check it out. Today I am sharing four more great tips to navigating the college classroom that I hope will be very beneficial for you as you begin to navigate your first college courses. Your professors expect you to do the reading for the day. You may be able to slowly slip by in class without doing so, but in order to get the most out of each class, you need to make a habit out of at least skimming the text of every class. I have a great post on this blog called Reading With Purpose: Article Skimming 101 that I highly recommend if you read a lot of articles. The advice below is if you are reading the chapters of a textbook. Headers, just like in my blog posts (or in academic journal articles), really say a lot about the article you are reading. If you don’t have a lot of time to skim, I really suggest going through the chapter and reading the headers for clues as to what your class will be about. If your college textbook has pictures, look at them. Pictures, charts, and visuals can be such a great way to learn about the reading in a quick and easy way. I always loved looking at the pictures in my textbook. Also some professors like to take a few test questions here and there from the captions of charts and pictures to mix up the test a little, so when you read those you can gain some valuable information. Book chapters usually have some pretty great and lengthy introductions and conclusions. You can learn a lot by taking a few minutes to read both of them before class. That, hand-in-hand with reading the headings, is a really great way to at least get a quick understanding of what your class will be about. If you have a little bit more time and you want to get really in depth (without reading everything)? Try reading the first and last sentences of most (if not all) paragraphs in your textbook. This takes way more time than some of the other skimming techniques I have shown, but if you have more time than most, this is a great way to skim a textbook chapter before class. In a lot of introduction undergraduate textbooks, there is usually a list of questions at the end of the chapter (or some objectives at the beginning of the chapter.) If you have some time, I would go through each of those lists of questions, read them, and see if you can at least come up with a decent answer for each one. Professors may pull from those questions in class (or even on a test) so going through those questions and seeing if you can answer them is a great idea! Before I begin the section, I do want to start off with this, I got my Bachelors in Sociology with a Criminology concentration and a minor in Anthropology. Sociology (and the other subjects I mentioned) are extremely subjective, and so I feel it may have been easier to feel less judged when I answered questions in class (sometimes completely wrong). I haven’t spent an awful lot of time in classes outside the liberal arts, so I am not sure if the same rules about speaking up in class will apply to other majors in disciplines like math where there is always a right answer. So, how do I do this? I just muster up the courage and say something. If you have been paying somewhat attention in class it can be easy to fake knowledge (or at least give a super vague answer.) Participation in class is super important. In some classes, just participating can be worth such a huge portion of your grade that it would be impossible to get an A without participating. Here are my tips for participating like a pro. My biggest thing to say is don’t wait to participate. Answer when you know the answer. Participation is participation regardless of whether the answer came easy or you struggled to answer the question. So, don’t wait for another question to come along in the lecture, because you may not know that one as easily. If you have an additional thought to add to something add it. Especially within the liberal arts there are often too many interpretations and interesting things to say about one topic. If you can add something interesting to the conversation, add your two cents. Don’t just rehash what the other person said, but if you can add to it, do it. The next thing is, you have to stop being afraid of being wrong. The feeling of despair I get when I get something wrong in class is quick (and a little bit painful to be honest. It feels like something just drops in the middle of my stomach like I am on the top of a roller coaster about to go down. But then, as soon as it drops, it’s gone. I don’t have any more fear in my belly. I am free to pay attention to the lecture once more and answer more questions. Yes, it might be a bit embarrassing to get something wrong, but as soon as you have that feeling it’s gone. Put yourself out there and your education will grow so much as a result of that. Depending on the professor, some professors count asking a question as participation. After you get done with the first day of class ask your professor what they consider participation and if asking questions about the material being taught might be considered participation within the course if you are worried. I think that most professors would consider questions that are specific to the lecture and show that you have been paying attention a part of your participation grade. If you can’t get by on answering the questions the professor gives, try asking your professor a discussion question. Taking notes in class is so important. I have a great blog on the site all about taking notes like a pro, but today I am giving even more advice on that. Note taking in college classes is so important because it’s a part of how you will be able to follow up on all the information you got in class that day while in other locations. The first thing is simple (but also hard to do). Most people don’t think about all the interesting ways that note-taking can happen, but it’s also important to note that the main thing you want to do is actually pay attention and retain information from class. Should I handwrite or type? Some people do better with typing their notes, but I am definitely more a handwritten person when it comes to notes. Being on the computer distracts me, and I retain the information much better when I handwrite my notes. The focus that I get from not typing and actually absorbing the information helps. How much is too much organization for in class? You can always re-arrange, color-code, and make your notes a million times fancier outside of class. In fact, I really encourage you to go back after class and look at and perfect your notes. In class though, it’s okay to be a little sloppy and all over the place. You want to make sure that you are not spending so much time with your notes that you are not listening to the lecture. What note-taking method works for my class? Not all note-taking methods work for each class. You may want to do an outline for one class; Cornell notes for another; and a mind map for another class. Figure out which method works best for the way that the professor presents the information. What information does the professor give me? Some professors are totes amazing and they give you lecture slides. If your professors give you slides, use those slides. Don’t try to reinvent the wheel here. To make note-taking easier, I usually print the slides on the three slides to a page setting with note-taking space on the side of each slide. This is my favorite setting in PowerPoint. Then after I take that to class and doodle and take notes on it as usual. Until I went to class as a graduate assistant I never really thought about repeated words, and I honestly never caught them. Once I started going to class as a GA, I really picked up on when the professor was repeating words and phrases. It is an art, but once you get the art down, you really have it down, I think. The first thing you need to do if you want to be able to effectively listen for repeated words is know what in the world you will be learning about that day. By skimming, as I suggested earlier, you can understand what words might come up often based on the textbook, and really begin to see patterns before you ever step foot on campus. The next thing you need to do is listen. A lot of people constantly write in class, but they don’t take time to be in tune with their professors and listen to their voices. Instead of writing out a million things until your hand cramps, take a few breathers and listen to what your professor says. Third, take note of anything in the slides that has its own dedicated slide or anything the professor writes on the board. These things are going to be important. If your professor spells something for you chances are it is important too. Be sure you are picking up on all the clues your professor is dishing out. If your professor uses words like, “Take note of this…” or “This would be a great test question…” or “This is very important” make sure to note that in your notes. Last, re-read your notes after class. You may be able to add in some extra bits and pieces of information in hindsight. While you were writing something down in class you may not have noticed it, but when you go back and replay the class in your head you may remember your professor talk about something a lot. When I see something that’s repeated a lot in class, I usually put a star next to it, highlight it, underline it, or write it in a different color ink pen depending on how I am feeling that day. Make sure you have a special way of categorizing things like that in your notes. Lastly, when it comes to taking notes and writing down what you hear in class know this—if you have a question, chances are your classmates have a question. Sometimes, everyone in class is too shy to ask a question, but you can tell that everyone is very confused because their faces are contorted or they look like they are about to die of thinking. Be the hero. Professors may get so wrapped up in the lecture that they forget to check in on the classroom to make sure that everyone is actually enjoying the lecture. Make sure you let them know you have a question, or they may skip on to the next thing prematurely. This is especially important in math and science classrooms were material often builds upon previous material. If you don’t understand the first part of the lecture, you may be continuously lost throughout the rest of the lecture. I hate to say it, but sometimes, it’s just you. Sometimes your classmates actually aren’t confused and they want to move on to another subject. Read the room, do you see some eye rolls and sighs coming from half the room? If that’s the case, you may just want to ask your question after class (if it can wait) that way you aren’t taking up valuable class time. The last time we are going to talk about today is how to be a leader during group work. I have a great post all about creating more effective group projects but that post is definitely more focused on out of class group work. A lot of my group work in classes though took place in the classroom. Here are my tips on being a leader during group work and acing group work in class. Group work is not my favorite thing to do in the world. It has never been something that I like to do. I could complain and toss and turn about having to find a partner for group work in class, but that won’t accomplish anything. If it’s a part of your class learn to tolerate it so you can meet new people. If you have been getting to know your classmates like I talked about in yesterday’s post then it will be really easy to find a partner and be more awesome. No one likes to volunteer to do things within group work in class. Make sure finding people to do things doesn’t take forever and step up to share your group’s thoughts with the class or write your group work on one sheet of paper. The sooner you get that done, the sooner you can discuss. Last semester I graded a few in-class group projects, and the things I mostly docked points for was clearly not following directions. If you have a clear list of directs, follow them so that you can make sure you get 100% of your participation or assignment points that day. Nothing worse than a few careless or sloppily labeled responses that dock you a few points on an easy assignment. While group work is supposed to be an easy assignment, you still need to follow directions so be sure you keep up with that. More than anything, group work is about the discussion that ensues when you get together with your classmates to talk about what you wrote about or whatever the assignment is. The discussion is the best part, and for me as a graduate assistant, listening to the discussion was my favorite part of being in a classroom. You get to hear all sorts of new and interesting perspectives, understand where your classmates are coming from, and really get to branch out in your knowledge of the class. I love group work for that reason. When you are discussing, make sure that you are being conscious of the terminology in the class that might really help move the discussion along and help position you as knowledgeable to your professor in class. Mention those terms in whatever write up takes place or whenever your present to the class. 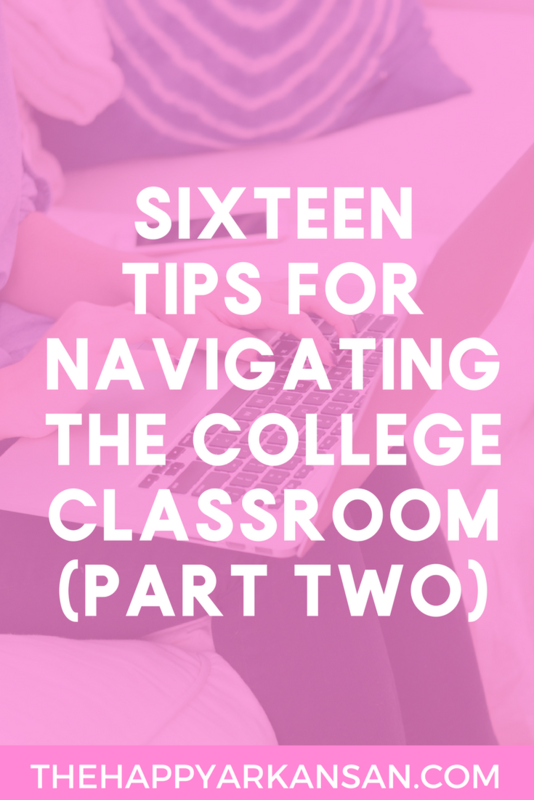 I am so excited for Day 2 of 3 in my “16 Tips For Navigating The College Classroom” series is done. I really hope that you enjoyed today’s tips. I really think that I have learned a lot and these are some of my best tips for surviving the classroom and looking hella smart while doing it. Join me tomorrow morning for the last eight tips to navigating the college classroom. These tips won’t be as in depth, but they will definitely be just as valuable.